Patty Jenkins's Wonder Woman is set to fly into theatres soon, and upon its arrival next month, Niagara Falls is set to play host to a massive fan tribute to the DC Comics heroine. Niagara Falls Comic Con (NFCC) is set to dedicate June 2 to the highly anticipated film with a cosplay meet up and advance screening of the film. Fans are encouraged to dress up as Wonder Woman or don her colours to win prizes during a dedicated march and ribbon cutting ceremony at the brink of Horseshoe Falls. 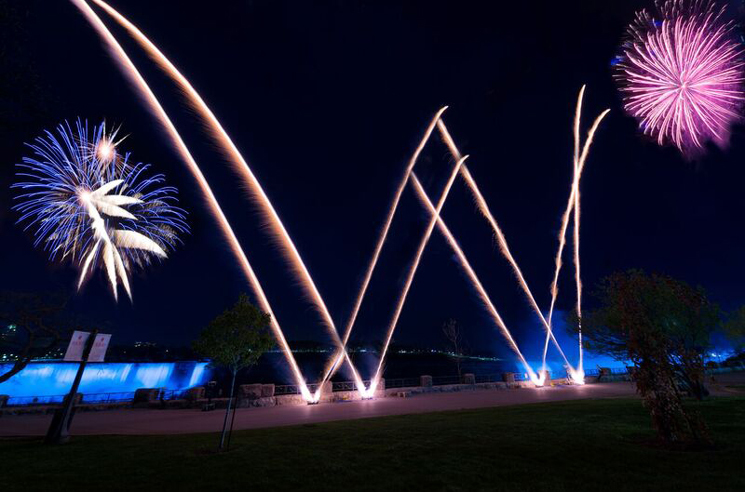 The evening will play host to a fireworks display featuring plenty of Wonder Woman's giant 'W,' as seen above. The NFCC will also host a dedicated Wonder Woman area at which fans can create their own gauntlets and enter for a chance to win a replica tiara from the film's production. Fans are asked to meet a 9 a.m. at the Table Rock Centre in Niagara Falls on June 2. Wonder Woman lands in theatres the same day.